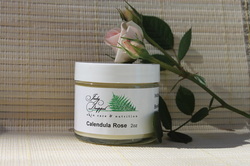 My richest, loveliest, healing cream and one of my most popular. Only truly pure ingredients in a base of organic comfrey root, a bit of this cream soothes the most overworked, dry, or sensitive skin. Because of the comfrey and calendula it will soothe and heal troubled skin as well. So diversified that my clients put it on everything that could use a healing. Just a little bit goes a long way. Usage: Can be used day and night for normal to dry skins. Ingredients: Almond Oil, infusion of Certified Organic Calendula, Beeswax, Shea Butter, Vitamin E, Essential Oil of Neroli, Borax, Flower Essence, preservatives borax and potassium sorbate.